I believe the young Muslim in India has contracted a rarely reported case of isolated cysticercosis (from the prok tapeworm Taenia solium) of the sternocleidomastoid muscle. This condition has been published in scientific journals a few times (1,2,3), and was the first result to pop up upon googling “sternocleidomasoid muscle parasite”. The 1-2 cm mass fits the approximate size that the calcified cysticercus would create upon lodging into the muscle, and the fact that this lump presents no other symptoms shows this could be an isolated incident rather than a systemic infection. A brief summary on cysticercosis versus taeniasis: when a human host consumes uncooked meat infected with the pork tapeworm cysticerci, the worm will mature in the small intestine as a full-fledged adult. However, when the eggs of the tapeworm are ingested by the host, they will develop into larvae that can migrate out of the intestine, enter the bloodstream and circulate into musculature. There, the larvae will form cysts in about two months, and these may not present clinical symptoms for years. This can be particularly dangerous if the cysts develop in the brain, leading to the potentially deadly neurocysticercosis. So how did an Islamic student who does not eat pork as it is forbidden under the rules of halal come to be infected with pork tapeworm eggs? I suspect that the student either came into contact with the eggs somewhere on campus (highly unlikely, as there would probably be no need for pigs to be anywhere near an Islamic school) or the most likely case is the Hindu dorm parents accidentally contaminated the food they were preparing for the patient. Pork is not explicitly forbidden in the Hindu religion, and it is possible that the cooks came into contact with pork tapeworm eggs at home or another local environment contaminated with pig feces. Cysts located in the muscle, particularly those that are asymptomatic, may be removed surgically or left alone to calcify and involute. However, anthelminthics such as albendazole or praziquantel may be used to treat the cyst along with corticosteroids to mitigate potential inflammation. Thank you once again for the informative and entertaining podcasts! I am a long time listener of the show, in fact, I have been listening since the beginning of Twip and listen to most of Vincent’s podcasts. I used to write in frequently, but I don’t have a lot of time anymore since you guys have inspired me to go back to school at 40 years of age to study a Bachelor of Science, majoring in Microbiology at University of Queensland. I plan on completing a PhD eventually and doing research in cancer immunotherapy. But at the moment, I am plodding along slowly part-time, as I still work full-time and run a gym. Now onto the case, I believe the gentleman from India is suffering from Cysticercus as caused by the parasitic cestode Taenia Solium. Although Daniel went to great lengths to stress that this man held to his religious beliefs and customs, implying he did not eat pork. His housemates who were responsible for preparing the food were not muslim and most likely consumed pork and were infected with the adult form of the tapeworm and most likely did not maintain proper hand hygiene and contaminated the food. I hope my guess is correct and that I am in the running for the book. My guess is that your Indian student with a mass in his left sternomastoid has cysticercosis: a pork tapeworm larva, stuck in a dead-end host. Although this devout student strictly avoids eating pork, those who prepare his food do not. I suspect the parasite was acquired by faecal-oral transmission of eggs from a human carrier of Taenia solium. Without a scan, the DD would be tough for this case. In India I use to see TB scrofula in young and old, but not typically in adults. Neck lumps can also be caused by histoplasmosis, coccidiomycosis, and other fungal diseases; toxoplasmosis and of course onchocercosis (but not in India). Cysticercosis cellulosae or human cysticercosis, an infection by the larval stage of the pork tapeworm taenia solium. I will not comment on how a Muslim eating food prepared at a Hindu school might have acquired this infection. If the mass is a cysticerci, it probably could be treated with Albendazole (400 mg BID) for a month or more. Keep up the great work. If I’m fortunate enough to be selected for the book, I already own Dickson’s most excellent Parasites to Plowshares, but would sure love a hard copy of Parasitic Diseases (6th Ed). Weather in Kona is about 27ºC today but I’m flying out this morning to Port Morsby and on to Wewak, PNG, where it will be somewhat warmer. Hope to still catch TWIP there, if I can get out to a wifi somewhere. My case guess for TWiP 136 is intramuscular cysticercosis caused by Taenia solium the “pork tapeworm”. If I am correct, this is another interesting case of immaculate conception by a kosher/halal person. I must admit that I had to google if Hindus eat pork (google says maybe?). So, the dorm parents contracted the tapeworm by eating under-cooked pork, and transmitted it to the student via eggs in feces. There have been case reports of isolated intramuscular cysticercosis. That would be an unlikely best-case scenario for our patient, but CNS and eye involvement should be ruled out. Treatment will depend on what tissues are involved, but will likely involve steroids and albendazole. The dorm parents and other students will also require treatment. The differential diagnosis could include abscess, TB, and lipoma. Thanks again for the fantastic show! I went to the Monterey Bay Aquarium last weekend, and it made me think of your Blue Apron commercials. I’m looking forward to This Week in Immunology! My guess for this week’s case study is cysticercosis. At first, when thinking of parasites that encyst in muscle, I jumped to Trichinella or a Sarcocystis zoitocyst, but neither fits this case well, since both have encysting stages that are much smaller than the 2 cm lesion reported in the young Indian man. The reason that I did not immediately associate cysticercosis with this case is that I’ve mostly heard about cases of neurocysticercosis, and therefore was not as familiar with the characteristics of a case with an intramuscular cyst. However, after some googling and consultation with Parasitic Diseases, 6th Edition, I found that the characteristics fit well with this diagnosis (i.e. approximately 2 cm, hard cyst, embedded in muscle, a few weeks of rapid growth). The young man would have gotten this infection by ingesting the egg stage of Taenia solium, the pork tapeworm, likely as a result of some unsanitary food preparation techniques. Since he only seems to have a single intramuscular cyst, would you be worried about, and warn of the possibility of, neurocysticercosis, or just think of this infection as a fluke? I believe that treatment would be Albendazole, possibly in combination with Praziquantel, but will depend on if there is an additional diagnosis of neurocysticercosis and/or adult tapeworms in the gut. What do you do for patients like this, who are exposed but have no control over their own food preparation? Is there suggestion to warn those who do prepare the food, or just treatment and hope that infection will not happen again? Thank you so much for your podcast. I have an absolute passion for parasites and look forward to listening to your cases, research, and friendly banter on a regular basis. I’m a first year pediatric resident at Baylor in Houston, and will actually get to spend a year abroad as part of my program in Africa in which I selfishly hope to see many of the wonderful creatures featured on your show. Based on the information you provided, I must make the assumption your patient does not eat pork- which rules out his having Cysticercosis (Taenia solium, the pork tapeworm). The next parasite which comes to my mind which forms cysts is Echinococcus. My understanding is Echinococcus granulosis more commonly forms in the liver and lungs, however I did find that rarely in endemic areas, the hydatid cysts form in muscle tissue. They have a marvelous life cycle involving carnivores (such as dogs) and a sheep/goat/swine intermediate host. The diagnosis was sealed for me with the hint of ultrasound use, which is the “go to” for low cost diagnosis (though CT and MRI could also be used). I listened with both amusement and interest to the last TWIPcast, concerning pinworms, and I thought I would send in a general pediatricians perspective. “Shouldn’t I do a paddle test first?”, I asked. I was confronted with reality this past winter when I had a family who all had pinworms. They had tried several rounds of pyrantel pamoate without success. I tried to prescribe mebendazole (Vermox), which was denied by the insurance company because the pills were now $500 each, and anyway, not available currently in the U.S. They suggested albendazole, which cost a measly $200 a dose. I have since learned that a new mebendazole (EMVERM) will be available, but I have no idea of its price point. I must admit, I sometimes make a leap to the diagnosis, as I did in this case, so I was glad that one reader sent in a proper differential diagnosis of rectal itching. I have spent a professional lifetime trying to make sure I at least consider other diagnoses so as to avoid premature closure, a dangerous cognitive bias. The case this week also made me jump to a conclusion. As I was listening to the podcast, I concluded that the child had Ascariasis. I was unsure whether the place (the Dominican Republic) was relevant, but that poverty and the lack of modern facilities for the disposal of waste were. One further anecdote. When I was first in practice, a mother rushed into the office, hysterical at having discovered a large worm in her toddler’s diaper. I figured it was probably Ascaris, but as she had the worm in a bottle, we sent it to the lab for more expert identification. The report was not Ascaris lumbricoides as we expected, but Lumbricus terrestris, the common earthworm. The solution to the case was the 4 year old sibling, who thought it would be funny to put a worm in his brother’s diaper. I wager 100 quatloos that I will continue to listen to TWIP. I am writing from Flagstaff Arizona where the monsoons are bringing relief to a hot and wildfire prone time in the southwest. Thank you for your continued work bringing the world of parasitism to life for interested listeners, I am a huge fan. I have a B.S. in Geology and work as a fisheries biologist in Grand Canyon National Park, pursuing becoming an expert in Grand Canyon ecology. Over the last couple years (coincidentally when I began listening to TWiP) I began documenting the presence of parasitizing larval trombiculid mites on different lizard species found on the Colorado Plateau (see attached photo). I plan to turn this special interest into a Masters project in the coming year. Case Study: The gentlemen living in Queens suffering from an itching and burning foot blister sounds to be suffering from a classic case of guinea worm – Dranunculus medinensis. While little information is provided about this individual’s medical and travel history, an itching, blistering foot with “something in the blister,” and relief when submerged in water are signs and symptoms associated with this nematode. A gravid female D. medinensis will migrate to the skin of the host and is subject to high internal pressure from embryos in the uteri. The pressures within this nematode will result in a loop of the uteri to burst through its cuticle allowing the release of juveniles. A chemical in the uterine fluid causes blistering in the host and the eventual rupturing of the blister provides an exit to the skin’s surface for juveniles. Contact with cool water instigates muscular contractions of the female, releasing as many as more than half a million juveniles at a single time. As the uterus is exhausted it disintegrates eventually resulting in the worm expiring. Perhaps the most telling piece of information given in the case study breakdown was the treatment given by the visited parasitologist. Wrapping the end of the worm around a small stick like a toothpick is an ancient technique depicted in woodcuts and even possibly described in biblical verses, depicting Moses putting a fiery serpent upon a pole. The seal of the American Medical Association and the double-serpent caduceus of the military medical profession are also thought to symbolize the extraction of a guinea worm. No other organism I am aware of is treated in this fashion. After pulling the nematode out of the wound site as far as possible without breaking it, and winding it about a small stick, the stick and worm bundle is taped to the patients leg to be further wound later. Eventually it is possible to extract the entirety of the female from the wound site and barring any secondary bacterial infections the wound should heal. This process can take anywhere from a few days to weeks to complete. It is conceivable that the gentleman could treat himself, so long as he is shown the technique to wind the worm, minimizing risk of breaking it. Symptoms typically do not present themselves until about a year after infection, this timeline makes sense with the gentleman’s arriving in the United States 9 months ago. Infection occurs by consuming drinking water contaminated with copepods carrying guinea worm larvae. Juvenile D. medinensis must enter water directly to survive, closely tying the life cycle of this organism to drinking water. In a rural resource limited area, a communal water source was likely responsible for infecting the gentleman. Infected individuals entering the pond or stepwell to collect drinking water would express guinea worm larvae directly into the water thus propagating the cycle. According to the CDC website only 126 cases of guinea worm infection were reported in 2014 with those cases originating in Chad, Ethiopia, Mali, and South Sudan. Given that the gentleman went to see a parasitologist I think it likely he had encountered guinea worms before in his rural village if their source of drinking water was contaminated. Thank you for all the passionate hard work! 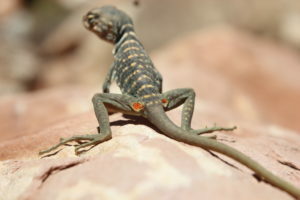 The photograph is one I took of a great basin collared lizard – Crotaphytus bicinctores, taken near the Little Colorado River in October of 2015. The individual had heavy mite loads on its haunches, forelimbs and ear openings. It was also behaving uncharacteristically sluggish in the heat of the day. I wonder if the Cyclops or perhaps Daphnia “water fleas” that live in ponds and lakes here (NY Metro area and/or other parts of the USA) can serve as a Link in the Old World Guinea Worm’s life cycle? I wonder if the juvenile Guinea Worm can survive the winter with a copepod as a hibernia? Presumable the water that was used to soak the afflicted’s foot was just dumped down the drain. I wonder if any larvae released were consumed by copepods in the sewer? I am a fan of the listeners getting to participate in the differential diagnosis. A bit less of the newfangled audio files. Compared to the letters, helpfully interspersed with commentary from the hosts (and perhaps occasionally truncated), it’s a bit long-winded. Glad that Dickson is back! I am a vector entomologist, working on Aedes mosquitoes. Long-time listener, first-time e-mailer. I subscribe TWiV, TWiM and TWiP; I like TWiP the best. I meant to e-mail much earlier, but could not and now I do because it seems that the question is still a mystery (it sounded solved in the show). Sorry I am not giving answer either. On TWiP 131 a question was brought about tick bearing young. I thought that Jonathan Larson answers it, or at least, gives some thoughts on it. And on TWiP 133 Anthony wrote on google search on “tick, viviparous”, which resulted in some “sheep ticks”. As you may already know, “sheep ticks” or “sheep keds” generally does not refer to true ticks, but instead they are insects. Sheep keds belong to the family Hippoboscidae in the order Diptera. So they are actually flies. Adults of Hippoboscidae are dorso-ventrally flattened, brown-colored, and some are wingless (apterous), which resemble ticks. Although they look different, Hippoboscidae are close relatives of Glossinidae (Tsetse flies), and they bear fully developed larva. The larva does not look like adults (because flies undergo complete metamorphosis), and transform into a pupa, and an adult. If Dave had seen “a tick” bearing “a young”, it would have been a sheep ked, but he described that “Out of the cut in half tick came a pile of baby ticks.” The one Dave has seen was not Hippboscidae, because a fly can bear only one larva at a time. I guess that tick eggs may develop in the mother and burst out after hatching. Sorry again this is not the answer.